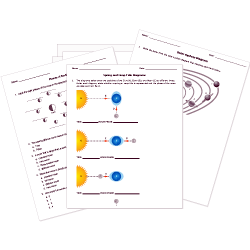 Check out our pre-made Astronomy worksheets! You can create printable tests and worksheets from these Grade 11 Astronomy questions! Select one or more questions using the checkboxes above each question. Then click the add selected questions to a test button before moving to another page. The Moon casts a shadow on Earth (Moon blocks out the Sun). Earth casts a shadow on the Moon (blocking out the Sun). He invented calculus, laws of physical motion, and a law of universal gravitation. The Sun is composed mainly of which two gases? The Moon likely formed when there was a collision between an object in space and . Why are temperatures so extreme on the Moon? It is far away from the Sun. The wind is always blowing. clusters of stars very near each other in space. groupings of planets in the sky. patterns of stars in the sky. close associations of stars and visible planets. A lunar eclipse occurs when the Moon passes between the Sun and Earth. He built telescopes better than anyone shortly after their invention and used them for astronomical observations. the greater the observed blueshift. the more massive it is. the greater the observed redshift. Pluto, Makemake, Haumea, and Eris are all located in the . Who was the first person to propose that Earth and the other planets move around the Sun? will have a brighter absolute magnitude. will have a brighter apparent magnitude. What is the fuel for the nuclear fusion in the Sun's core? This is the darkest, smallest part of an eclipse. About how much longer do scientists think the Sun will exist as we know it? is one of Jupiter's moons and also the largest moon in the solar system. Which dwarf planet is located in the asteroid belt?